In order to get an SSL certificate for your website, you need to generate and submit a Certificate Signing Request (CSR) to the CA (Certificate Authority). A CSR is an encoded message submitted by an applicant to a CA to get an SSL certificate. In other words, it is a request from an applicant to a CA to get a digital certificate. A CSR contains a public key and the applicant's information such as FQDN (Fully Qualified Domain Name), organization name and address. The CA validates the applicant's information and issues an SSL certificate with the public key included in the CSR. Generally, a CSR is generated using the web server where the SSL certificate is going to be installed. However, it can also be generated using SSL tools or a modern browser such as Chrome or Firefox. The most common format for CSRs is the PKCS #10 specification. 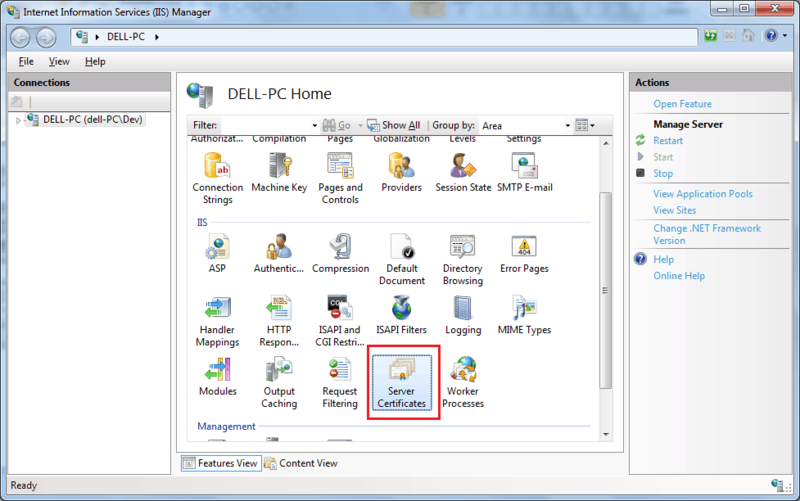 A CSR can be generated using any web server. Here, we are going to generate a CSR from IIS 7. Click Start -> All Programs -> Administrative Tools -> Internet Services Manager. 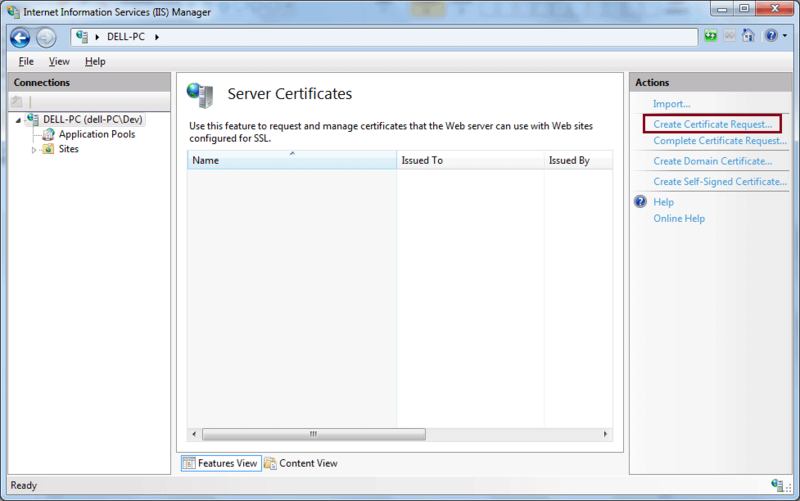 In the Internet Information Services (IIS) Manager window, select your server and double-click Server Certificates. 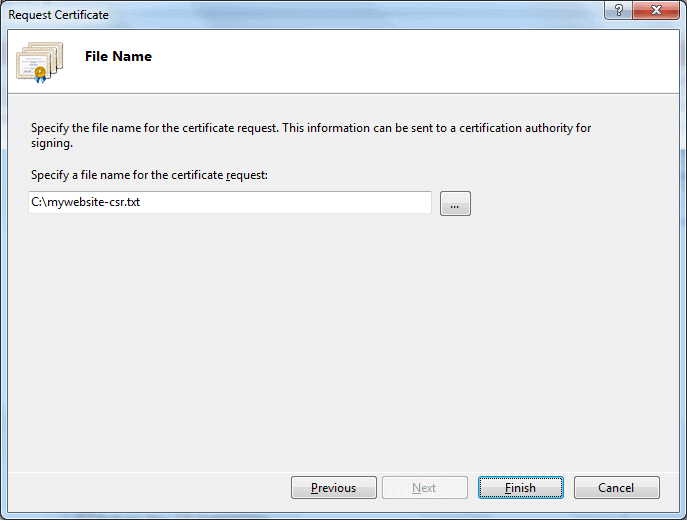 In the Request Certificate dialogue box fill in the information specified below and click Next. 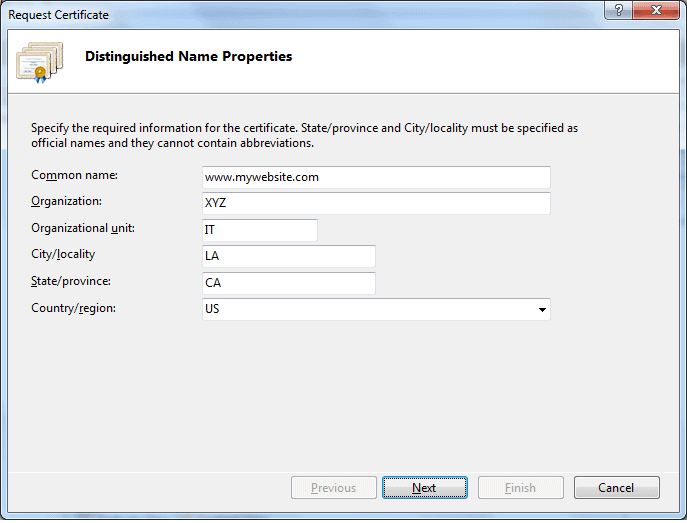 Common name:	The fully-qualified domain name (FQDN) (e.g., www.mywebsite.com). Organization:	Your company's legally registered name (e.g., My Company). Organizational unit:	The name of your department within the organization. This entry will usually be listed as "IT". City/locality:	The city where your company is legally located. State/province:	The state/province where your company is legally located. Country/region:	The country/region where your company is legally located. Use the drop-down list to select your country. 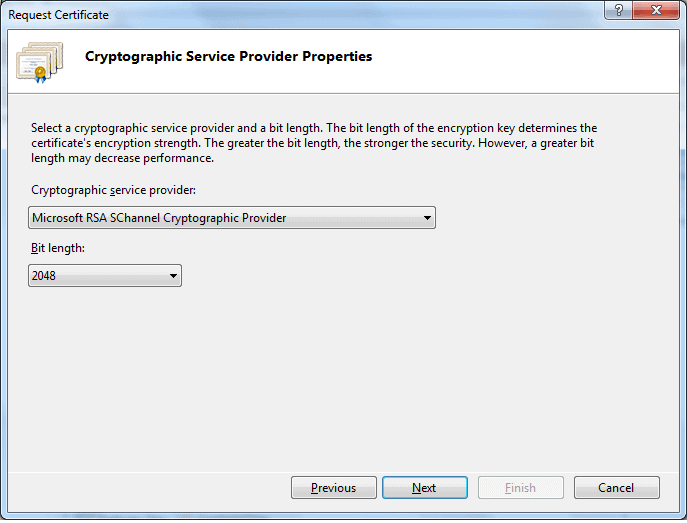 On the Cryptographic Service Provider Properties page, select Microsoft RSA SChannel Cryptographic Provider as the cryptographic service provider and select 2048 Bit length from the dropdown, as shown below. Click Next. The above CSR includes a public key and other identity information we provided in the Base64 PEM format. If you are using a different web server then visit thesslstore's knowledgebase and click on the link of the web server you are using to know how to generate a CSR for your web server. A CSR includes a public key generated by the web server where you are going to install an SSL certificate. The web server generates a key pair, a public key and a private key when the CSR is generated. It includes a public key in the CSR and also stores a private key secretly in the file system. This private key will be used when installing a certificate on the web server.